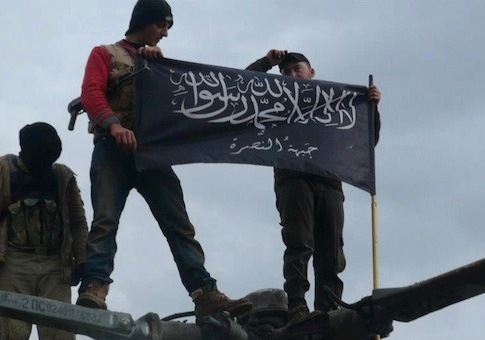 U.S.-trained rebels that reentered Syria over the weekend after completing the Pentagon program allegedly gave their weapons to the al Qaeda affiliate in the region, al Nusra. The Telegraph reported that rebels fighting with Division 30, the rebel group with whom the U.S.-trained Syrian fighters are partnering to combat the Islamic State, surrendered and handed over weapons and ammunition to members of al Nusra, according to members of the al Qaeda affiliate in Syria. Abu Fahd al-Tunisi, who identifies himself as a member of al Nusra, wrote on Twitter, "A strong slap [in the face] for America … the new group from Division 30 that entered yesterday hands over all of its weapons to Jabhat al-Nusra after being granted safe passage." "They also handed over a very large amount of ammunition and medium weaponry and a number of pick-ups," al-Tunisi added. Another alleged al Nusra member, Abu Khattab al-Maqdisi, claimed on Twitter that the commander of Division 30 Anas Ibrahim Obaid said he tricked the U.S.-led coalition in order to obtain weapons. "He promised to issue a statement … repudiating Division 30, the coalition, and those who trained him," al-Maqdisi wrote. U.S. Central Command said Monday that approximately 70 U.S.-trained Syrian rebels had reentered Syria after undergoing training in Turkey. The Pentagon plans to overhaul its effort to train rebels to fight the Islamic State. This entry was posted in National Security and tagged Al-Nusra, Syria. Bookmark the permalink.